HAPPY NEW YEAR - World Premiere of the English Adaptation! at DEGUSTATION just on the next block! piece of the show work with an audience, it will get even better and better. This show deserves a full commercial production. Dressed as an octopus for a NYEve costume party! Constance Labbe and Christopher Heard have teamed up to bring a "very French" play by a very hot French playwright to New York in an English adaptation. Carole Greep is one of Paris’ most successful playwrights. Her very first play, 'J'aime beaucoup ce que vous faites' has been running in Paris uninterruptedly since 2003. Her next play, 'post‐it', played over 500 times, in many different theaters including the Palais des Glaces, one of Paris' most famous and popular theaters. Starting in 2008, her play 'la Bombe' -­in which Constance Labbe played the title role-­was in production in Paris and on tour all over France for over two years. Carole also writes for stand-­‐up comedians and has written short films and TV scripts. Christopher Heard is originally from Southern California. He now resides in New York City where he has become a budding member of the theatre scene. Having started in stand-­up comedy, he then spent a year studying Uta Hagen's technique at HB Studio. Christopher played the title role in the feature film The Curse of Duncan Carbunkle and most recently starred in plays Balm in Gilead and Beach Trip, both directed by Amy Wright. Mark Blum is a Broadway veteran. As an actor, he has appeared on Broadway in Twelve Angry Men, The Graduate, A Thousand Clowns, Gore Vidal's The Best Man, Lost In Yonkers, My Thing of Love, and The Merchant. Off-­‐Broadway, he won an Obie Award for his performance as Al in the Playwrights Horizons production of Albert Innaurato’s play Gus and Al. Mark has extensive credits in film and television. He teaches at HB Studio in NY, and in the graduate training program at Brooklyn College. Mark also writes, directs and produces for the stage and the screen. UPDATE - California Chrome WINS the Preakness and has a chance to win the Triple Crown at the Belmont Stakes on June 7. We've bought our tickets to the Belmont Stakes! -- watch for upcoming stories! California Chrome won the Kentucky Derby and is a big favorite to win the Preakness. Of course, if he wins the Preakness, he will be going into the Belmont Stakes on June 7 with a chance to become the first horse in decades to win the Triple Crown. Only two other horses from the Kentucky Derby are competing in the Preakness, General a Rod, who came in 11th, and Ride on Curlin who came in 7th. Rosie Napravnik, the acclaimed female rider will be riding Bayern, trained by Bob Baffert. Here is the list of horses running. The Kentucky Derby finish position (if the horse ran) is in red brackets, the Morning Line (expected odds) is in parenthesis(). The four top favorites are in brown. UPDATE - THE FINISH IS IN BLUE. Interestingly, three of the top four favorites ended up in the top three. All three horses that were in the Kentucky Derby finished in the top four. Open Roads: New Italian Cinema, will take place from June 5-12, 2014. Open Roads has served as the leading North American showcase of contemporary Italian cinema for the past 13 years. This edition includes the latest work from established veterans (Gianni Amelio, Roberto Andò, Daniele Luchetti) and top award winners, alongside promising new talents from both the commercial and independent spheres, with in-person appearances at many screenings. This year’s festival highlights the emergence of exciting works by many documentarians, and explores hybrid combinations of documentaries and fiction, with more than a third of the films focused on the medium with rich and fascinating results. Top prizewinners include Gianfranco Rosi’s Sacro GRA, the first documentary to win the Golden Lion for Best Film at the Venice Film Festival, which explores Rome’s 43.5-mile highway, Grande Raccordo Anulare, that encircles the city by focusing on absorbing, moving individual portraits that emerge from the areas drivers pass through but never see, to reveal a different side of the bustling city’s inhabitants. 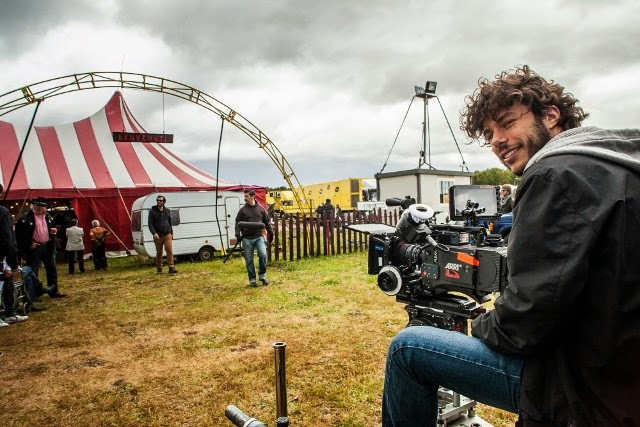 Alberto Fasulo’s docudrama debut Tir won the top prize at the Rome Film Festival and follows a former teacher from Bosnia who takes a job driving a tractor trailer (“tir”) through Europe. Combining professional actors and real truck drivers, Fasulo has created a striking film about what life is really like on the road — a film that that simulates a documentary. Other documentaries include Vincenzo Marra’s Naples-set The Administrator, which looks at a building administrator’s dealings with his larger-than-life tenants, providing a tough-minded yet affectionate portrait of an Italy mired in crisis. Gianni Amelio’s Happy to Be Different is a moving, enlightening work of oral history of gay life in Italy from the fall of Fascism through the early 1980s. Several films in this year’s lineup explore the evolution of Italy’s political transformation. including the opening-night selection, Daniele Luchetti’s Those Happy Years, a charming, coming-of-age autobiographical tale of the director’s childhood as a budding filmmaker growing up in Rome in the 1970s during a radical, transformative period in Italy. Giovanni Veronesi’s The Fifth Wheel is a humorous tale that takes audiences on a journey of a half-century of pivotal political events through the eyes of actor and screenwriter Ernesto Fioretti. Politics and social issues facing Italians also play a role in Gianni Amelio’s A Lonely Hero, starring comedian and actor Antonio Albanese, whose character learns to reinvent and adapt himself to any job as a professional substitute (train conductor, fishmonger, tailor, etc. ), as a result of the country’s unstable unemployment crisis. Roberto Andò’s Long Live Freedom is a scathing critique of Italian political dynamics and stars Toni Servillo as a seasoned politician navigating the decline of his party by fleeing to Paris and hiding out at the home of his ex-girlfriend. Renowned TV host and political comedian Pierfrancesco Diliberto wrote, directed, and stars in The Mafia Only Kills in Summer, his feature debut about a young boy and his obsession with the Mafia’s presence in his city… and a beautiful schoolmate who remains his love interest until adulthood. The love story is set against a backdrop of some of Italy’s most tragic past criminal events. Edoardo Winspeare’s Quiet Bliss follows three generations of women who seek refuge in their family’s olive grove after their small textile business collapses and their efforts to revive their lives in the wake of economic catastrophe and the recession. Single screening tickets are $13; $9 for students and seniors (62+); and $8 for Film Society members. See more and play less with a discount package starting at $30; $24 for students and seniors (62+); and $21 for Film Society members. The discount package prices apply with the purchase of tickets to three films or more. Visit FilmLinc.com for more information. Luchetti’s warm-hearted, bittersweet autobiographical account of his childhood as a budding filmmaker growing up in Rome in the ’70s stars Kim Rossi Stuart and Micaela Ramazotti as unconventional parents caught up in turbulent times. He’s an avant-garde artist and she’s wrestling with gender roles as she discovers feminism and free love. Luchetti (My Brother Is an Only Child) brilliantly re-creates the atmosphere of urgency and rapid change surrounding the family. He also poignantly conveys his own coming-of-age perspective, that of a boy grappling with radical transformations inside his family and on the street, capturing it all with his brand-new Super-8 camera. In the lively and absorbing fifth installment in a series of docs celebrating his native Naples, Marra turns a spotlight on the life of Umberto Montella, a building administrator whose job seems to demand skills in management as much as in therapy. An effortless arbiter of the passionate conflicts that arise among tenants, the Quixotic Montella leads us in and out of the homes of his larger-than-life clients, rich and poor Neapolitans whose lives illuminate the city’s volatile moods. Sometimes funny and always poignant, these profoundly human stories flow in and out of one another following a natural rhythm. However specific the tales, characters, and places, the immersion into these entangled lives is also a tough-minded yet affectionate look at an Italy mired in crisis. Veronesi’s irresistible romantic comedy takes a journey through pivotal events in four decades of recent Italian history, as seen through the lens of Ernesto Fioretti’s unexceptional life. Played with charm and a disarming sense of humor by Elio Germano, Ernesto is a good-hearted, honest middle-class guy who struggles to keep up with changes and is always a step behind. His father disparaged Ernesto by likening him to the “fifth wheel of the wagon,” and his aspirations and involvement through the rise and fall of Socialism and the Berlusconi era are accordingly modest. But his protagonist’s apparent simplicity is precisely one of the strengths of this Tuscan director’s fifteenth feature, which opened the Rome Film Festival last year to great acclaim. Rich in emotions, its ups and downs coinciding with those of the country, Ernesto’s life serves as the perfect platform for abundant laughter and tears. A moving and enlightening work of oral history, Gianni Amelio’s new documentary is a chronicle of gay life in Italy from the fall of Fascism through the early 1980s. Amelio combines interviews with a wide range of older gay Italian men (including Pasolini muse Ninetto Davoli), newsreel footage, and clips from “educational” films warning against homosexuality, and in the process reveals a profound gap between the subjects’ firsthand experiences and the Italian media’s representations of them. The resulting film is a deeply personal account of the advent of gay culture amid the ruins of Mussolini’s Italy and the eternally poignant story of how persecuted individuals developed pragmatic ways to attain everyday happiness. Matters get very complicated for chief inspector Monaco (Silvio Orlando) after the murder of a high-profile member of Milan’s seedy nightlife. He is a widower with a teenage daughter, and, one night, all his neglected personal issues seem to catch up with him, forcing him out of the slump he’s been in since the death of his wife. Rendered darkly beautiful as a noir setting, Milan is the electric backdrop for this detective story that delves as much into the intimate life of one man and his daughter as into this elegant city’s underworlds. In his fiction debut, Olivierio’s extensive documentary experience is palpable in his portrait of Milan—a character in itself—as well as in the vivid and telling details with which he characterize its inhabitants. A band of brilliant unemployed and underemployed academics—two Latinists, a chemist, a neurobiologist, an anthropologist, and an economist—turn to a life of crime in order to survive. Deftly assimilating such influences as Breaking Bad and Trainspotting, this biting parody on the plight of the Italian middle class in the aftermath of the economic crisis boasts a fast pace, witty dialogue, and a terrific cast. A debut to watch from Salerno-native Sibilia, the film was a resounding commercial and critical hit when released in Italy earlier this year. Amelio follows his 2011 Camus adaptation, The First Man, with a deadpan parable about a small everyday hero from Milan who contends with the unemployment crisis in a very particular way: he’s a “professional” substitute worker, skilled and knowledgeable enough to replace anyone in any job. True to his name, Antonio Pane is as good and essential as bread. Whether working as a train conductor, fishmonger, tailor, street sweeper, or bricklayer, he approaches the country’s instability with a deep moral consistency as he reinvents himself everyday. Amelio wrote this film especially for actor Antonio Albanese, who personifies the film’s dark humor and underlying sense of hope. An Emerging Pictures release. Enrico Oliveri (a brilliant Toni Servillo) is a seasoned center-left politician and president of the opposition who realizes that the decline of his party is inevitable. As the polls announce he will lose dramatically in the upcoming elections, he falls into a profound existential crisis and disappears. We later learn that he has fled to Paris and is hiding out at the home of his ex-girlfriend Danielle (Valeria Bruni Tedeschi). While his colleagues panic, his top aide (Valerio Mastandrea) discovers that Enrico has a twin brother living in a psychiatric institution. What at first seems like a crazy plan soon proves to be their only solution. A scathing critique of Italian political dynamics, Andò’s film is also a pulsating thriller with great comic moments that brings together some of the most talented actors working in Italy today. Three generations of women seek refuge in their family’s Salento olive grove after their small textile business collapses in Winspeare’s warm and vibrant drama. Against the backdrop of a radiant southern Italian landscape, Winspeare’s characters—serene Salvatrice (Anna Boccadamo), hardened Adele (Celeste Casciaro), loudmouthed Ina (Laura Licchetta), and aspiring thespian Maria Conchetta (Barbara De Matteis)—revive their lives in the wake of economic catastrophe. Turning to a back-to-basics existence as a means of healing the wounds wrought by the recession, they undergo transformations that the director renders with equal parts pathos, insight, and humor. Sardinian third-league soccer team Atletico Pabarile is suddenly winning every match of the season, after years of losing consistently to Montecrastu, the team led by cocky and abusive landowner Brai. The return of soccer wizard Matzutzi from a sojourn in Argentina has turned the team of farmers into unexpected champions—and now it feels like anything is possible. Enter Cruciani (a great Stefano Accorsi), a young referee greedily climbing his way to the top, and two cousins playing for Montecrastu who are involved in an escalating conflict about archaic sheep-breeding codes in Sardinia. These disparate plots come together explosively in the lush black-and-white world of Zucca’s slyly funny and utterly distinctive first feature. The first documentary to win the Golden Lion for Best Film at the Venice Film Festival, the latest from Gianfranco Rosi (El Sicario, Room 164 and Below Sea Level), reveals the sheer diversity of life bubbling around the margins of Rome’s Grande Raccordo Anulare, the 43.5-mile highway that encircles the city, the longest in all of Italy. The absorbing and often moving individual portraits that emerge—an ambulance driver caring for his ailing mother, a scientist studying palm trees ravaged by beetles, an eel fisherman nostalgic for old traditions—give visibility and a human face to the places Sacro GRA drivers pass through but never see, while exposing the city’s striking contradictions. Inspired in part by Italo Calvino’s novel Invisible Cities, Rosi’s captivating chorale plunges the viewer into this paradoxical reality, allowing us a more direct, even sensorial experience of life in the shadow of progress. Best friends Luisa and Renata long above all else to leave their stifling provincial town in northeastern Italy, where tensions between locals and immigrants are forever threatening to boil over. They work as maids in a hotel but supplement their income with sexual trysts, sometimes assisted by Luisa’s Albanian boyfriend, and hatch a blackmail scheme that fails to play out as expected. The rhythms of daily life in this border zone—where city meets countryside—are captured in vivid detail in the highly promising fiction debut by Rossetto, an experienced documentarian working mainly with nonprofessional actors. Grazia was 12 years old when she was told by her widower father that her beloved older brother Pietro had died, and never spoken a word since. Now a tomboyish 18, after one of her regular arguments with her father, Grazia flees to the seaside and into the water, where she has an otherworldly experience and thinks she sees her brother. Thus begins her quest to discover another truth, not only about her lost sibling but also about herself. This poised and striking debut by the young Mollo, who shot this film in the Reggio Calabria village where he grew up, features a remarkable central performance by the young Miriam Karlkvist. Above: visiting HIFF in 2009 as a "Rising Star"
Based on her own novel, Emma Dante’s first feature is set in Palermo and shot almost entirely in a narrow alleyway in a run-down neighborhood. On a hot Sunday afternoon, three women are caught in what turns out to be a tragic confrontation. Rosa (Dante) and her partner, Clara (Alba Rohrwacher), have just driven in from Milan and are on their way to a friend’s wedding. As they turn onto Via Castellana Bandiera, they find the Calafiore family jammed into a car driven by Samira (Elena Cotta), a mule-headed Sicilian of Albanian descent. Both drivers stubbornly refuse to back up, as tensions escalate and the neighborhood looks on. An accomplished theater director, Dante includes some knowing nods to spaghetti Westerns and genre conventions in her ambitious film debut, and coaxes formidable performances from her skilled cast (Cotta won the Best Actress Award at the Venice Film Festival). The first Italian film to win the top prize at the Rome Film Festival, Fasulo’s striking fiction debut follows Branko (played by Branko Zavrsan, from the Oscar-winning No Man’s Land), a former teacher from Bosnia who takes a job driving a tractor trailer (“tir”) through Europe. A native of Friuli with a documentary background, Fasulo immerses the viewer in the experience of the trucker on the road—the sounds, the landscape, and the longing for company (Branko’s phone conversations with his wife are particularly poignant). Part of a growing movement of Italian filmmakers exploring hybrid combinations of documentary and fiction, Fasulo uses both professional actors and real truck drivers, and his approach yields both an intimate connection to his characters and an evocative sense of place. Before we mention ANDREW GARFIELD, star of the new acclaimed Spider-Man, or that top musical group COLDPLAY, we should mention, first, that SNL has a double header hit tonight showing the Kentucky Derby as well as this new SNL. is terrific with many classic video clips from SNL past. It's worth a visit to browse around! COLD OPEN -- Donald Sterling -- Tackling a touchy subject with some humor, some courage. Brilliance? not so much. MONOLOGUE -- A little kibitzing from Emma Stone (they're "partners"). A passable monologue. Not bad. Not great. STANX -- First funny moment of the show. Underpants that keep the hot air safely stored (at least for a while). CELEBRITY FAMILY FEUD -- Andrew is a fine Justin Timberlake. Drake and Crowe had some funny moments. Other impersonations barely OK.
OLIVER TWIST -- OK I Guess. Not really funny or interesting. THE BEYGENCY -- A funny short video. They know when you don't like the music. COLDPLAY -- Kind of a warm, low energy, somewhat interesting sound. WEEKEND UPDATE -- It ran the gauntlet this week from unfunny to unpleasant. SPIDER-MAN KISS -- Can't get that final kiss just right. Hilarious. COLDPLAY -- Silly rhymes. Silly moves. Music's fine. THE BIRD BIBLE -- A funny idea, but there were no funny jokes. Andrew was very very good, and some sketches were quite funny, but there were too many badly written skits. And when the whole cast gathered at the end, Andrew & Emma still didn't get a good kiss off. Andrew Garfield (Aug 20. 1983 - 30 - 5'10) is a British and American actor. He received a GG nomination for his role in The Social Network. COLDPLAY is a popular, award winning, socially conscious British Rock Band consisting of Chris Martin, Jonny Buckland, Guy Berryman, Will Champion. It was formed about 18 years ago. Their most recent album -- this year -- is Ghost Stories.